We are so excited to announce the launch of our new online printed cupcake shop “Print Cakes.” Local orders can still be placed at Baked Cupcakery, but Print Cakes can send our personalised cupcakes across the UK! We have been baking logo and photo cupcakes for years at Baked and we thought it was about time we shared them with the whole UK. 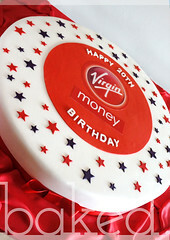 During our time in the kitchen, we have created thousands of branded cupcakes for lots of companies, even Sir Richard Branson has had a bite. 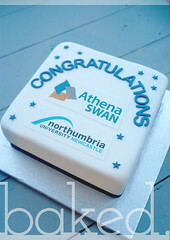 Last year we made over 7000 to celebrate the launch of the new Transpennine Express, now that is a lot of cake. 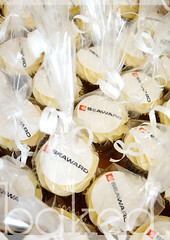 See our corporate cupcakes here. Print Cakes will not only continue supplying logo cupcakes for businesses but also create personalised cupcakes for birthdays, gifts and well… pretty much any occasion (there’s always and excuse for cake). It has a large selection of ready made designs, some of which can be personalised with names. There are also photo upload and message cupcakes available, is there anything better than eating a cupcake with your face on it?! See our personalised cupcakes here. They are available in boxes of 6 and 12 for smaller gifts, or you can order up to 100 online for parties and larger celebrations. If you require even more cupcakes (7000?!) then you can get in touch at hello@printcakes.co.uk or give us a call and we will sort it all out for you.